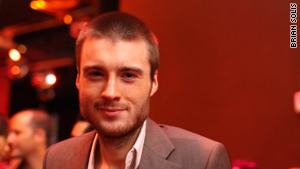 Mashable's Pete Cashmore says Facebook's new "Like" button lets the site deliver a more personal experience to users. London, England (CNN) -- Facebook this week announced a new way to express your interests -- a "Like" button that's set to appear all around the web. Click the button, and the Web page is shared with your friends. What's more, every "Like" you submit ensures Facebook (and its partner sites) can deliver a more personalized experience to you. It's a simple yet powerful feature -- one that delivers a significant blow to rival Twitter. Once the network effects take hold, it's frankly hard to imagine how any company could unseat Facebook's social networking dominance in the months to come. Without a counterattack, even Google may one day be dethroned. Twitter, Facebook's direct competitor, has so far been unable to match the social network's growth rate. Twitter has 100 million users; Facebook has 400 million. The size of the network is important, since Web publishers and Web developers want their products and services to gain the greatest exposure possible -- given the choice, they'll choose the social platform with the most users. Publishers, for instance, may choose to put a Twitter "Retweet" button or a Facebook "Like" button on their pages. Given that the majority of Web site visitors have Facebook accounts, the choice becomes an easy one. Not to mention that Facebook's button's are far more powerful: They tell a visitor how many friends have liked a story, while an additional widget suggests other stories you might like. The "Like" button will accelerate Facebook's growth by spreading its tendrils to every corner of the web. Likewise, Web sites can offer the ability to "Log in with Facebook" or "Sign in with Twitter". Conversion rates will likely be higher for those sites that choose Facebook. In every case, the biggest site wins. Meanwhile, Twitter's relationship with its developer community -- the coders who fueled its growth by creating Twitter applications for phones and the desktop -- has hit a rough patch. Twitter's acquisition of a popular iPhone app and the release of an official application for BlackBerry users has led some developers to wonder whether they should build Twitter applications at all -- won't Twitter just release an official application for every device and kill off all the upstarts? Facebook's Like buttons and new tools, by contrast, offer endless possibilities for developers. Unless Twitter can reboot its growth and convince developers that building Twitter applications is worthwhile, Facebook will surely extend its lead. Facebook looks set to challenge the web's biggest players, too: Google is under siege by Facebook's new-found ability to target search results and ads. Google dominated the web in the era of interlinked Web pages. Every link from one Web site to another counted as a vote, determining the most relevant pages for any search term. The result: An unbeatable search engine. Except that links between Web pages are no longer the most abundant source of relevant recommendations -- instead, people are sharing links with friends on social networks like Facebook and Twitter. Now Google is paying those sites for access to public updates, but it lacks key data that would allow true personalization of search results. Google doesn't have a complete list of your friends, combined with a list of their interests. Facebook does. Facebook is in a position to build the world's best search engine: One that delivers results based on your friendships and interests. The launch of the "Like" button, meanwhile, means that Facebook will know more about your individual preferences than ever before. Facebook: The World's Best Ad Network? Google makes the vast majority of its money from ads -- these ads typically match your search terms, or the content of the Web page you're viewing. Google has certainly worked to personalize these ads, but its knowledge of your friends and interests is more limited than Facebook's. The data gleaned from thousands of Facebook Like buttons around the web could make for an ad network that rivals Google's AdSense. If Google is to maintain its once insurmountable lead in search and advertising, the company surely needs to perfect social networking. Google Buzz, the search giant's most recent foray into the social space, received criticism from privacy advocates who noted that a user's email contacts were made public upon signup. The early hiccups may have been fixed, but Buzz has so far failed to catch on. Other social projects from Google -- OpenSocial, Google Friend Connect -- are so latent at this point that few are even aware of their existence. If Google is to fend off the Facebook threat, it needs new ways to mine a user's interests and social connections. The hard way would be to develop a new competency in building social applications -- something Google has struggled to do. The easy way? Buy Twitter. While Facebook is perfectly positioned to lead the next charge, success is by no means guaranteed. Twitter is set to release "annotations", a way to append extra information to Tweets. Google has enough money on hand to buy, well, whatever it wants. And Facebook's user base is volatile: They may one day decide to embark on a mass exodus, causing Facebook to fall like MySpace and Friendster before it.